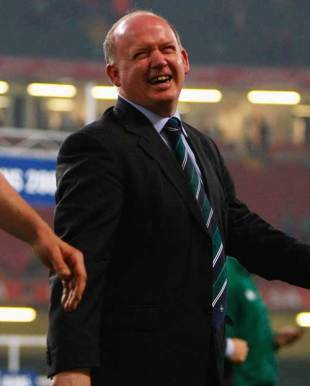 For the first time since being appointed Ireland head coach in 2008, Declan Kidney finds himself under pressure. Not 'Kidney Must Go' banners or online petition pressure, nowhere near, but while, up to now, Kidney has emerged from the wreckage of bad defeats relatively unscathed, should things go pear-shaped in the Six Nations (which could happen very quickly), the heat will be on. The win over Australia in Auckland guaranteed that Ireland's Rugby World Cup performance would be remembered as their finest to date (although this is not saying much) but the players have since admitted to feeling uncomfortable at being feted on their return. Four months on, there is general acceptance that, for all the positive aspects to Ireland's tournament experience, New Zealand 2011 was a massive opportunity squandered. Ultimately, Ireland were undone by a younger, more adventurous Welsh team who attacked the ball with greater depth and purpose and subscribed to the old 'give it a lash' approach of former Ireland coach Mick Doyle. The logical conclusion was that Ireland would take that painful lesson on board and inject some youthful vigour into their Six Nations. Not a bit of it. Paddy Wallace was always going to be the barometer of change - Kidney's favourite back-up player, a competent and committed centre/out-half who has been on the Ireland scene for nearly 10 years without ever nailing down a regular starting berth. Wallace was taken to New Zealand ahead of the game-changing potential of Luke Fitzgerald and, despite failing to make the first-choice side and then missing a chunk of the season through injury on his return, the 32-year-old was named in Ireland's Six Nations squad. As were Leo Cullen (34) and Shane Jennings (30). Both are fine players and central to Leinster's awakening as a major European force over the last four years but neither could be deemed a progressive selection. Cullen provides solid cover in the second-row, as does Jennings in the back-row but, just as there was with Wallace, there were in-form younger alternatives to promote. While England are desperately pursuing a new dawn, Ireland experienced no dire need to distance themselves from the World Cup with the result that there are no players in the Six Nations squad who were not also in New Zealand. And, for the most part, that is fine but there was still scope for two or three younger players, a Peter O'Mahony, Chris Henry or Dan Tuohy who would have provided Kidney with some wriggle room as well as providing tangible evidence that form in the Heineken Cup was being recognised. Naming Fitzgerald in the Wolfhounds rather than senior squad also sent out a bad message regarding form selections. Injury complications (Fitzgerald has since been withdrawn from the Wolfhounds match) meant the Leinster man needed the A game but his outstanding displays this season merited Six Nations inclusion. Ireland's safety-first attitude is undoubtedly influenced by the World Cup seedings, based on ranking positions, which will be determined at the end of the year. Kidney's challenge is to keep his side in the top eight (they are currently sixth), at the very least, which, with a three-Test series in New Zealand this summer is easier said than done. "Kiss and Tainton should bring some innovation and freshness to Ireland's back play after Gaffney but the overall approach will be a pragmatic one, due to the World Cup seeding, win at all costs prerogative." It is why the Ireland coach is placing a premium on bv. The World Cup showcased a need for Ireland to widen their attacking repertoire and, with Alan Gaffney's contract expiring after the World Cup, Kidney chose to expand the coaching briefs of Les Kiss (defence) and Mark Tainton (kicking) rather than bring in a new man. So, put it all together and what can we expect from Ireland this Six Nations? Kiss and Tainton should bring some innovation and freshness to Ireland's back play after Gaffney but the overall approach will be a pragmatic one, due to the World Cup seeding, win at all costs prerogative. Much will depend on their opening clash with Wales at Lansdowne Road. The glass half-full scenario sees Ireland gaining conclusive revenge for their World Cup quarter-final defeat and travelling to France knowing that victory could open a path to a second Grand Slam in four seasons. This is backed up by the genuine confidence bubbling around the squad following the provinces' strong showing in the Heineken Cup with Munster, Leinster and Ulster all making the quarter-finals, the first two as top seeds. Kidney's task is to transfer the provincial vigour that has accounted so impressively for the likes of Bath, Leicester and Northampton this season into a green jersey. If he manages it, Ireland are in business, if he fails and Warren Gatland masterminds a third win in a row over the Irish with France to follow six days later in Paris, the tournament could quickly slip away. That is when the pressure would heap on Kidney. You suspect it will not come to that, Ireland have too many quality players. However, a huge amount will hinge on how well they have absorbed their lessons from a painful night in Wellington.